Orbital Sciences launched a Minotaur 1 rocket from Wallops last night, carrying ORS-3: an Air Force satellite, two experimental payloads, and several small cubesats, including TJ3Sat, a small satellite developed by students at a local high school. We went up to the roof to watch the launch from Fairfax. I made the mistake of using ISO 400 for a 165 second exposure in moonlit conditions with city glare reflecting off scattered clouds, causing overexposure. 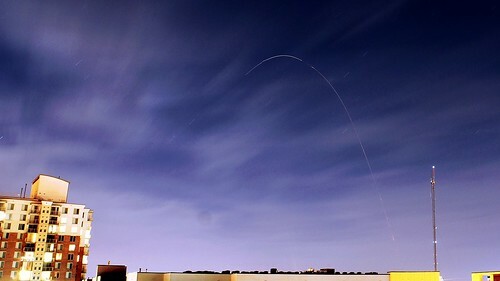 Some post-processing brought the rocket’s arc back into view, darker but higher and more rounded than the Minotaur V LADEE launch in September. This was a smaller, less powerful rocket, but still awe-inspiring to see, even from over a hundred miles away. NASA TV video of the Minotaur 1 launch up close, and more photos of the launch from up and down the East Coast via Capital Weather.